In the winter of 2017, The Crew Facility Maintenance hired us to fix foundation water intrusion in a Lakeville professional building. This is how we helped them. The professional building was a single-story office space. The main level was occupied, but the owner was unable to lease the basement level due to foundation water intrusion along the entire perimeter (435’). Waterproofing the foundation from the exterior would cause major disruption for the main level tenants and would be cost prohibitive. Our crew installed and interior drain tile system with a sealed HDPE dimpled sheeting vapor barrier. To avoid disruptive the employees in the building, we removed the floor and did other disruptive work activities after-hours. The installation was completed in 7 days and was ready for remodeling and new tenants. Drain tile was installed beside the footing and covered with rock & drain fabric. After pouring new concrete, our crew did final clean up and the space was ready for remodeling and new tenants. Products Installed: HDPE 4” perforated drain tile system, Platon dimpled sheeting, and 2 new sump systems. If you need help with your interior drain tile system, request a free estimate today! 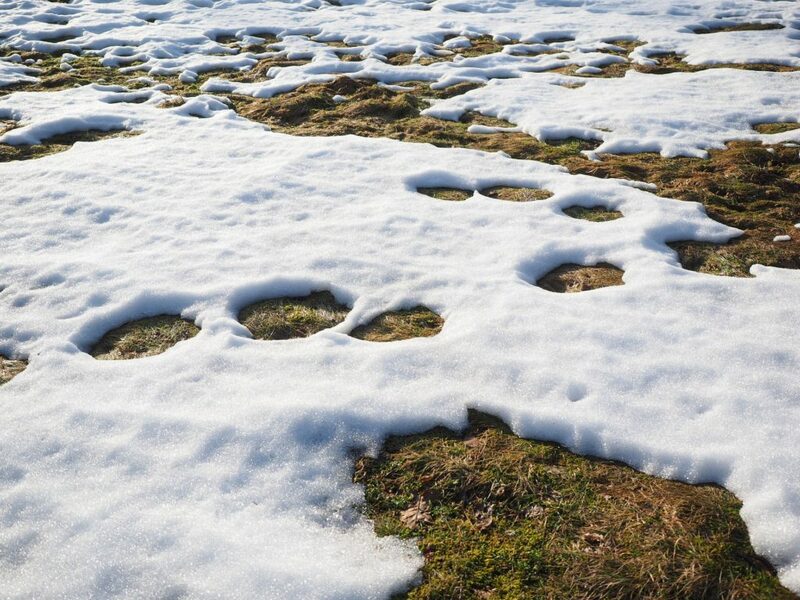 Have you noticed it’s been snowing a lot lately? Only kidding, of course. It feels like we’ve getting attacked by the weather this winter. Here in the Twin Cities, we’ve had one of the snowiest winters in Minnesota history. It’s pretty amazing, and we’ll definitely be bragging about how we lived through it in the future. It goes without saying, but water getting into your home is never good. Excess amounts of water can find a way into your basement, which causes damage to the walls and flooring in addition to your possessions. 2) Remove any snow from the rain gutter downspout so water has an open path to drain. If your downspout can’t drain properly, it can get backed up and the water will cause damage to your home’s exterior. Make sure to shovel snow at least 10 feet away from the bottom of the downspout to give the water enough room to avoid your foundation. 3) Remove snow from window wells. We get calls every week to repair egress windows because they were not properly installed. We’ve seen window wells turn into fish bowls, which inevitably turned into basement water problems. Dig out that window well or hire somebody to do it for you. You’ll help prevent damage to your window and basement and you’ll thank yourself in the long run. If you do end up with a damaged egress window, you’ll need the help of professionals. 4) Run the sump pump and/or the battery backup system to verify proper function. Your sump pump probably hasn’t been running for a while at this point, so it’s important to make sure it works. If your sump pump is broken or in need of attention, get it fixed fast to avoid flooding in your basement. At the first sign of a leak, contact us. We’ll repair window wells, drainage systems and the area around your home to make sure you’re safe from water damage. 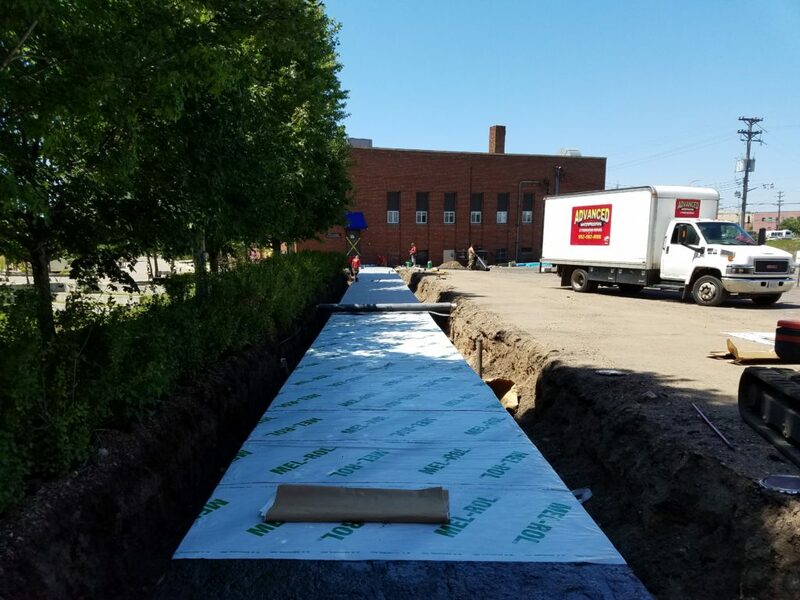 In the summer of 2016, Concordia University hired us to repair an underground tunnel at their campus in St. Paul, Minnesota. This is how we helped them. There was a 190-foot underground walkway that connected two university buildings. 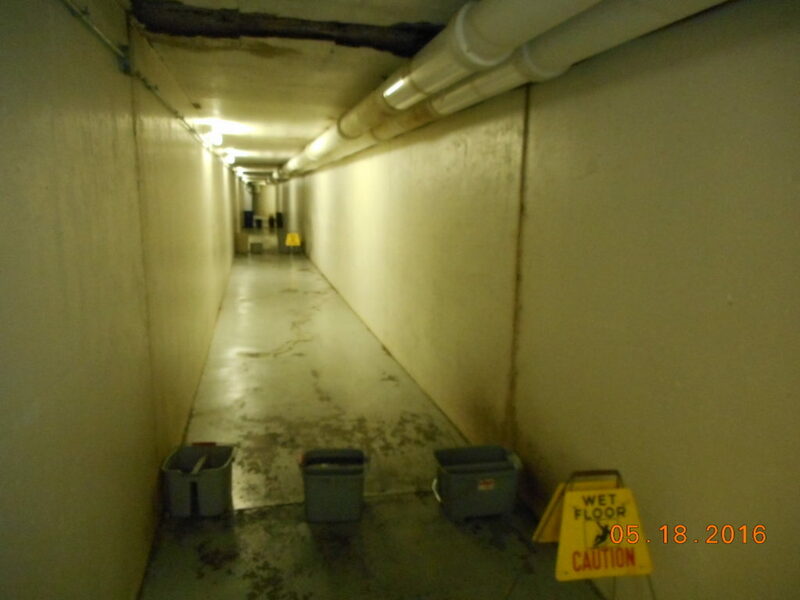 The tunnel was located beneath a parking lot and experienced significant water intrusion. The primary locations of water intrusion were the construction joints in the cast-in-place deck and the joint along the top of the cast-in-place foundation walls. Two challenges were discovered during excavation. First, there was a secondary layer of asphalt (old parking lot) beneath the topping that was removed. The secondary layer was in direct contact with the tunnel deck surface. This added time to the excavation and required the waterproofing system to be modified. The second challenge was that the exterior face of a 12-foot section of the foundation was badly deteriorated and required reinforcement repairs. Our crew excavated each side of the tunnel to expose the deck and upper portion of the foundation walls. We cleaned the substrate and installed a 3-layer, low-build waterproofing system and drain tile system with drainage outlet to daylight. Excavations were back-filled with washed aggregate to promote drainage and minimize potential of settlement in new asphalt. The project was successfully completed on time and within budget. 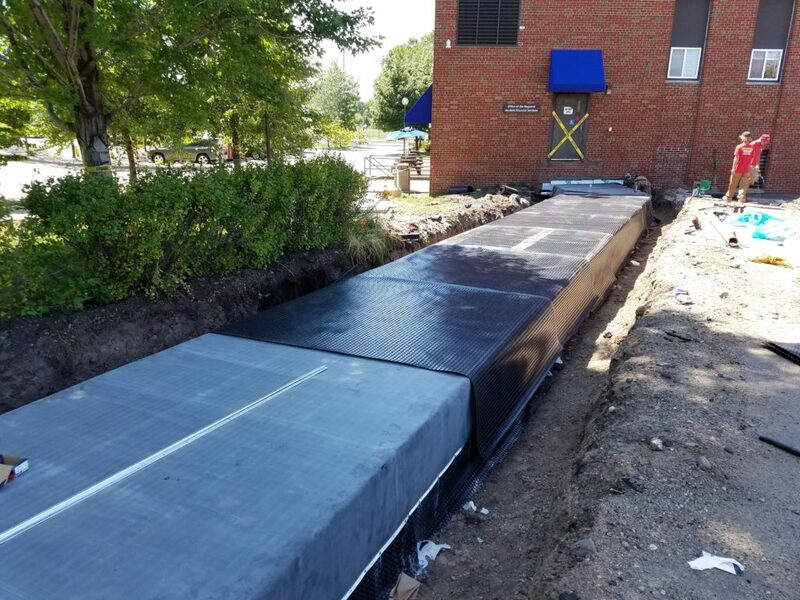 Products Installed: Mel-Rol waterproofing membrane. 45mil EPDM membrane. Platon dimpled sheeting. HDPE drain tile. If Your Organization Needs Sandjacking™,Concrete Lifting, Void Fills, or Waterproofing, Request A Free Estimate Today! In the winter of 2012, Toro Company hired us to repair their industrial warehouse floor in Shakopee, Minnesota. This is how we helped them. Toro’s industrial manufacturing floor slabs endured harsh conditions daily, including heavy equipment, steel-wheel forklifts, vibrating equipment, and more. These conditions resulted in damage to the concrete surfaces, joints, and nosing. Damaged industrial concrete creates safety hazards, is hard on equipment, and can inhibit and even stop production. A stop in 24-hour production was not an option, so the challenge was to get in, complete a quality repair, and get out as quickly as possible. We needed to repair the damaged areas with a polymer mortar that could be driven on 15 minutes after installation. Dustless equipment was used to remove the damaged areas to a depth of approximately 1.5 inches. Next, we applied a bonding agent and installed the polymer mortar (Floor Fix). The Floor Fix was ground flush with the adjoining floor surface and control joints were re-cut and filled with polyurea (RS-88). The manufacturing team was able to return to business as usual. 5 years later (2017), the repair sites were still in perfect condition. If your company needs updated warehouse floors, request a free estimate today! When a Burnsville homeowner’s basement flooded in the winter of 2017, we moved quickly to fix their basement and get their life back to normal. The homeowner had a sump basket without a pump. No sump pump was installed to move the water out of the home. The builder-installed drain tile system filled with water and flooded their basement. As a result, the entire basement had to be gutted and new building materials installed. We installed a drain tile system around the perimeter of the basement, which included installing a poly vapor barrier on the foundation walls to allow any condensation that may collect on the walls to drain into the new drain tile system. A new sump pump and battery backup system was installed to further protect their investment in their home. This system comes with a lifetime warranty, so they’ll be set if any problems arise in the future. In two days, we installed 150 lineal feet of drain tile, vapor barrier, radon connection, and a new Pro Series S1033 Primary / Battery Back-Up Sump Pump System. 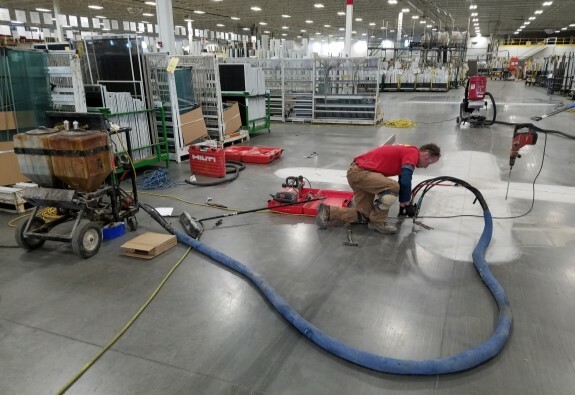 In the spring of 2017, we helped Renewal by Andersen level their concrete warehouse floors to help keep production safe and efficient. Renewal by Andersen had slab curl in their concrete warehouse floors. Slab curl is the warping of the edges and corners of the concrete slab. Slab curl is commonplace in large, indoor concrete floors, usually caused by drying shrinkage during installation. 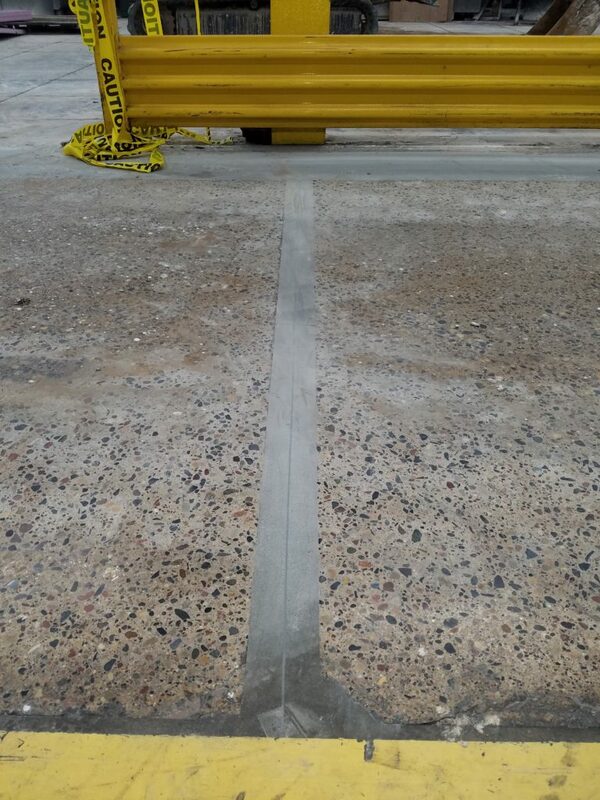 This curling creates small voids underneath concrete slab edges, leading to shifting of the slabs under forklift traffic. This movement increases damage to concrete, slows production, and is hard on equipment and personnel. Our teams began by measuring the amount of curl on the affected slabs. We then removed the exiting joint filler, drilled access holes in the concrete, and filled the voids with 5-pound structural polyurethane. This stabilizes the slabs and any loose soil beneath them. Following polyurethane injections, we filled the construction joints with polyurea joint filler. This long-lasting repair method is quick, clean, and requires little production downtime. 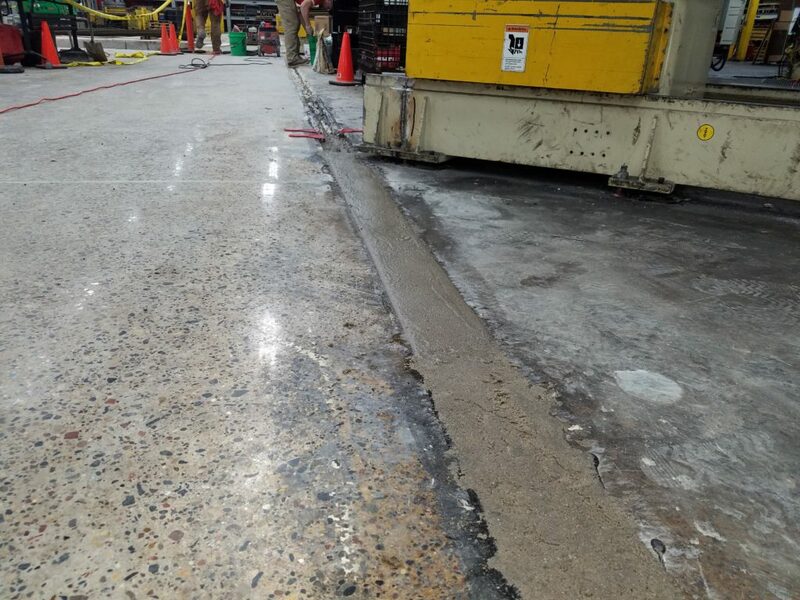 Forklift traffic was able to resume immediately after the reconstruction was completed.Renewal by Andersen now has a concrete floor that is level and safe for forklifts and foot travel. This mechanical room foundation in Eden Prairie, MN settled down and away from the building foundation. By installing helical piers, the settlement was recovered and the foundation is stabilized. You can see the helical pier process in video below. Settled foundation? Cracked walls? Doors and windows that don’t close? Request a free estimate or call 952-562-8100 to discuss your next project. While wood foundations are rare in Minnesota residential properties, multi-family structures with wood foundations are few and far between. This stucco condo building in Minneapolis, MN was leaking below grade. 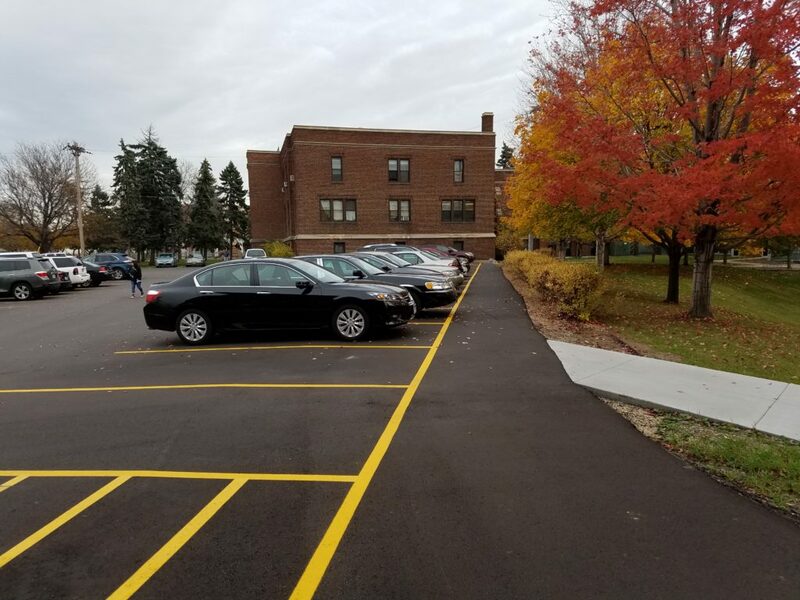 In partnership with Krech Exteriors and the Engineers at Certified Moisture Testing, Advanced Construction Services collaborated to design and execute the exterior drain tile system. 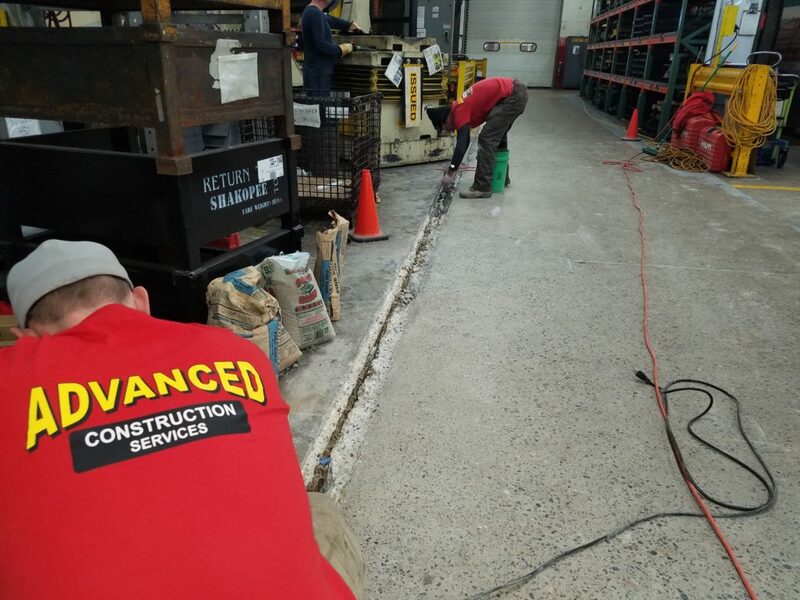 Advanced Construction Services is one of the few Minnesota contractors with the knowledge and experience to inspect, maintain and repair homes and business with treated wood foundations. ​We also install egress windows! For a free estimate, call 952-562-8100 or use our Online Estimate Request form. 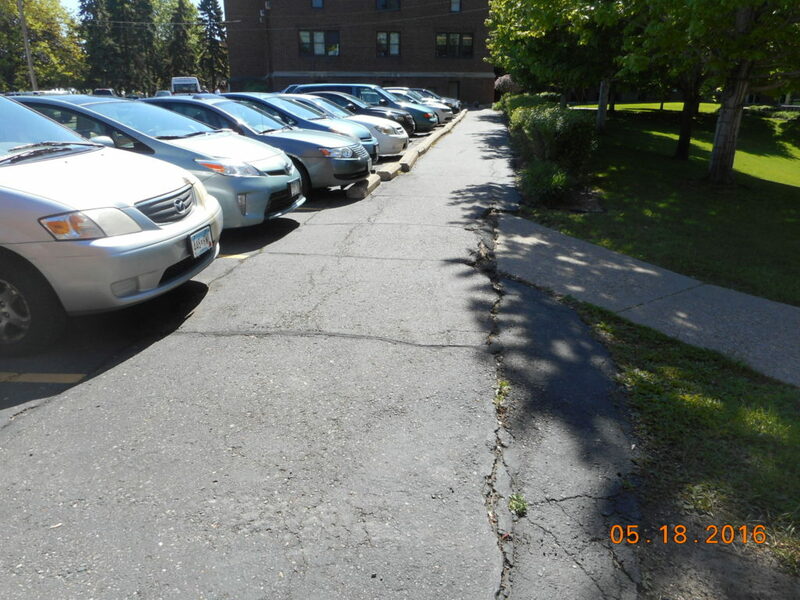 This asphalt roadway in Ramsey County, MN was filled with polyurethane foam. Learn more about Polyurethane Foam Lifting and call (952) 562-8100 for a free estimate. See the six holes up by the seam… Those are mudjacking holes from three years ago. This driveway has settled over 2.5 inches since then. Sandjacking is a superior solution to mudjacking, with an extended warranty. Compare your options and request a free estimate for your concrete lifting project.